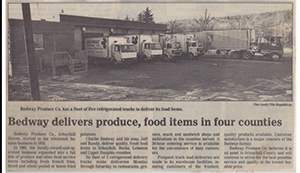 Bedway Produce Company is a family owned and operated business that has been providing exceptional service for over 50 years and 4 generations. 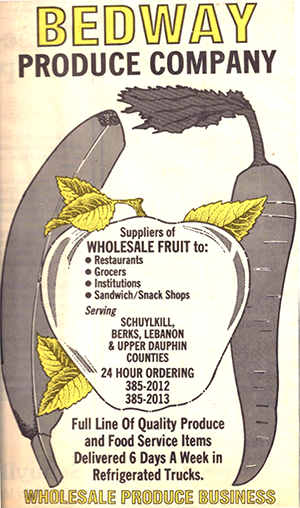 The business first started with the ripening and distribution of bananas to local supermarkets by Charles and Vilma Bedway in Pottsville PA. As the business grew and Charles’ sons began to take over, they added retail stands in local farmer’s markets to sell bananas and citrus fruit. In the 1980’s, the 3rd generation joined the business with Charles Jr’s sons Jeff and Randy. A full line of fruits and vegetables was added to their retail stands. This led to the expansion of the business into wholesale distribution to local restaurants. A cooler connected to the farmer’s market in Schuylkill Haven was stocked with products and distributed to local restaurants daily. Starting with 1 customer, the business quickly grew as word spread about the exceptional quality and service provided. The continued growth led to the construction of a distribution warehouse at 15 Builtwell road in Schuylkill Haven. The business expanded its distribution map to surrounding counties. The increase in business led to the ability to purchase direct loads from growing regions across the country. The dedication to providing quality products and service led to continued growth and expansion of the business. The customer base expanded from small local family owned restaurants to include multi-unit chain restaurants, grocery store chains, schools, and food service companies. The original facility underwent 4 large additions and renovations throughout the years to accommodate the increase in business. 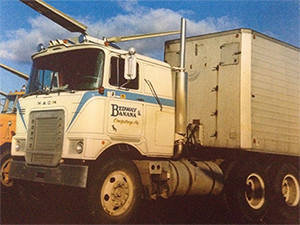 Recently, Bedway Produce increased its services to 6 states and welcomed the 4th generation into the business. The same hands on approach and dedication to customer service and exceptional quality that the business was built on still holds true today.